Volunteers are important. But more important are the reasons for volunteering, and the way an organization is managed to make it effective. Take a moment and learn from the pros. This checklist was adopted from a meeting I had the pleasure of attending this past winter. It was with a group of hams that are very involved in their community. Their participation spans from causal observation at parades, to real emergency events. Weather spotting is less than 10% of their mission. The rest is local community involvement. They have performed maritime directional finding, communication exercises with militia, training in schools and churches, and have drilled with other clubs to advance their skills in preparation for communications. 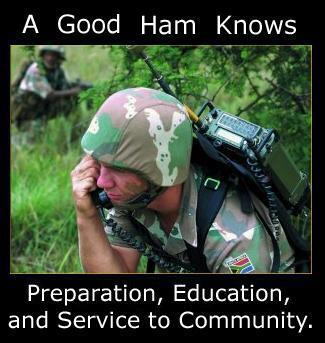 Their motto, "A Good Ham Knows: Preparation, Education, and Service to Community" speaks volumes. The thing most impressive is they do this not for the recognition, but because it's the right thing to do. In preparing this article about their organization they specifically requested no mention. What they did ask is that their suggestions and information be distributed freely on the hope that it will help other organizations gain the proficiency and achievements they have. The key point made at the meeting is that things just don't happen in a community. It takes people, local people, to be the soldiers of any organization. An organization, especially one in a rural area, is much more effective than asking the state or the federal officials to come in and solve problems. Volunteers know the community, know the people in the community, the communication capabilities, resources, and how to get things done! They are the link. Volunteering is an important and essential contribution to society. Without volunteers many of the tasks we face in life would be compromised. Without a volunteer fire department, how would a small community react to a downtown building fire? Without volunteer weather spotters, how would a federal agency such as NOAA get real time data from the field? You can't take volunteering lightly. Before pledging yourself to an organization, analyze all the reasons and your abilities. You should get involved if you can perform a service. You should not volunteer if you don't have commitment, ability, or preconceived notions how the organizations should be run. Bad volunteers cause problems within an organization, as well as personal and professional credibility issues. Most of all, they let down their community. Take for example a weather spotter that decides it's his responsibility to chase down a tornado and get in front of it to observe the winds and damage it causes. He announces he's going in and is not heard from again. His fellow volunteers and emergency responders are now placed in the position of focusing on him, and applying assets for possible search and rescue. How about groups of people that say they are volunteers, but don't do anything? How are they helping, and what is the public's view of other volunteers and the organization they represent? What if a volunteer EMTS organization never answered your call in a medical emergency? Let's look at this from both sides. First we will look at why you volunteer, and then we'll look at the volunteer manager. Before putting your hand up to volunteer, think about the following. Why do you want to get involved? Is it because you have the time and talents, or is it for the fraternity and recognition? Can you serve a productive, required need? The difference between a volunteer organization and a club is that the club is a fraternal organization. It is there for the meeting of other hams, and the sharing of interests. A volunteer organization exists to serve a need. Many people try to mix these two together, and it usually doesn't work. Why should people perform work and service to community when their reason for joining a club was just to have fun and meet other hams? We all have busy lives. Even retirees have full schedules. Are you able to volunteer, or are you are already over-committed? How much can you shoulder realistically? You should not feel obliged to take on a volunteer position if you are already busy with other things. Over-extending yourself is the first step on the path to burn-out and failure. If someone pressures you to do more, you do not owe any explanation whatsoever. Simply say, "I already have things to do." Volunteer only if you have time to do so. Are your talents needed? Is there something you want to do? This is an important question because it focuses on your investment in the group's mission. Are you joining a group of weather spotters because you want to provide information vital to public safety? You shouldn't volunteer just to get a sticker for your car, a badge, name in the paper, or because your friends belong. Separate personal wants and needs from service to your community. If you are not participating for the right reasons it's safe to say you're ineffective to the organization, and probably wise to move on to something else. Do you have the ability to perform the volunteer activities for which you are expected to perform? You would not want to become a volunteer firefighter if you have asthma, and you're afraid of fire. You would not want to be on an EMTS run if you faint at the sight of blood. Ask yourself the simple question, can I do what is asked of me? Tell the volunteer organizer about your skills, and explain to them any concerns you have to fulfilling your duty. Allow them to find a position best suited to your aptitude and interests. Don't take offense if your services are not required at first. Are your efforts competing with other volunteer and hobby positions? Are they politically challenged? To whom do you owe your loyalty? These may seem like odd questions but suppose you live on a county line. You're a volunteer with ARES in one county, and a RACES member in another county. Both counties call you up. To whom shall you serve? Another situation might be where you are a member of a club, and your buddies have a loyalty to the club and don't want you to be a volunteer of what they see as a competing organization. If there is competition, how might that affect your effectiveness in the scope of volunteering? If members of a club are going to attack you for belonging to another organization, it might be better not to volunteer. It's not fair to the volunteer organization if you have to keep looking over your shoulder for conflict, or your buddies are sniping at you on the radio. As a rule of thumb, if there is conflict, choose one or the other. Besides radio clubs and emergency positions, you shouldn't have to compete with family, church, school, and other personal commitments. If there is conflict with family or personal commitments, the club and organization should be a far distant second. Family first! Are you physically able to volunteer? There are certain stages in your life when volunteering may not be a good option. Someone who is retired and out of physical shape should probably not be involved in strenuous activities. However, their services could be used as net control, clerical roles, or simply to assist in coordinating activities. If you want to help with fieldwork, perhaps you could be a spotter for overhead electrical lines, or buried infrastructure. Or maybe just coordinate activities for the organization. Do you have the right equipment and resources to perform what is asked of you? Does your radio work properly? Do you know how to set repeater offsets, tone settings, and memories? As ridiculous as these sounds, I have witnessed hams that don't know how their radios work! If you can't operate your equipment, or don't have the proper equipment, perhaps you should resolve this problem before hindering an organization. You should know your equipment intimately. If you can't remember, carry a manual or instruction card with you at all times. Having spare batteries or a spare radio is a good idea, but it's an investment. Are you joining because of peer pressure? Sometime our friends are our own worse enemy. They may want more "numbers" in their organization. Or they may want someone to take over a position, and for whatever reason they feel you want the job. People are bullied and even coerced into volunteering. This is not a good reason to be a volunteer. It is not unusual to be elected at a meeting that you do not attend. Or be pushed into position in front of a meeting, belittled with questions why you won't accept on the spot. If you are present at such a vote, vocalize strongly your refusal. State clearly that you do not want the position, period, and ask those who are pressuring you to stop. If it should happen in your absence, send a carefully worded letter refusing the position, setting out brief reasons why, or simply say "I do not accept". I would also recommend sending this by USPS letter, receipt requested. With e-mail there is often the temptation by the recipient to forward it on with comments, or it can escalate into a long e-mail debate. Are you joining because of sympathy? Believe it or not, many people take on positions with volunteer organizations because they fear the organization's failure. "Ok, I'll do it because nobody else will", is a comment a lot of people have made, only to regret later. You shouldn't have to become a volunteer because you fear an organization's demise. This sounds harsh, but if an organization fails because nobody wants to be a part of it, then maybe it's not needed, or there is a lack of community support. Sometimes failure is an option when there is lack of need. And if needed it will rise from the ashes like the Phoenix. If you have to step in due to a vacancy, it is acceptable as long as you state a reasonable time period for your replacement. 90 to 120 days is typical. But never accept a long-term status out of fear that if you leave, you're responsible for putting the organization in the grave. Can you find a way to be a volunteer without killing your time, energy, or finances? Being a volunteer is a commitment. It can easily become a second or third job. Your position has a responsibility, but will it take you away from family, friends, and other duties? You should not volunteer if after your shift you feel physically stressed, or exhausted. Nothing will make an employer unhappy that to have you less than productive because of your extra curricular volunteer work. And your long-term employment could be affected if you choose to go spot weather events all night, and then call in sick to work the next day. Most volunteer organizations don't pay expenses. If you are called upon to drive distances, (as in weather spotting), do you possess the finances for gas? Will this activity affect the condition of your car to the point where you can't get to work? Can you afford to do the things an organization asks of you? Sometimes your volunteering is an investment. One trap volunteers get into is pledging their personal assets, or money to purchase assets for the organization. You should not entertain the thought of providing for group resources until you have carefully considering the consequences, and weighed all the options. Radios, antennas, cable, vehicles, generators, and places to hold meetings should not be donated unless you have a clear understanding that once you "give" them to the organization, there are no strings attached, conditions, or reasons to take them back. What is your level of commitment? Are you dedicated or are you just mildly interested? If you are prone to making excuses for not participating in events, nets, training, or meetings, this is probably a sign you have not invested fully in the organization. It is not fair to the rest of the organization if they can be 100% and all you can muster up is 40%. Do you use language to suggest that being a volunteer is less important, with no commitment? If you use the phase "I'm just a volunteer" as a way to explain away not performing your duty, you just established what you and your organization is worth. Nothing. If you can not commit, it's best to quit. And never make excuses. Are you risking your safety? You would be surprised at how many people have now made the transition between storm spotter and storm chaser. In some cases I have seen normally sane people get caught up in the excitement and drive into storms or dangerous positions. In the case of RACES, you encounter many situations where you might not be prepared or knowledgeable. Have you been properly training in hazards and health risks? You should request training from your organization on the dangers you will encounter. If you feel unsafe, consult the person in charge and let them know. Trust your instincts. If you are denied any safety training, you are within your rights to leave an organization. These are but just a few examples of questions you need to ask yourself when thinking of joining a volunteer organization. Be fair and honest with your assessment of your priorities. It's far better not to volunteer, than to say you will then not live up to your end of the bargain. Now let's look at the management of a volunteer organization. If your organization is self-sustaining then you need to run it like a business and not as a casual club. An example of a non-self sustaining organization is one like RACES, which is controlled at the top by an Emergency Manager. If your organization has a non-ham Emergency Manager in charge of your club your first task is to get them in the loop on what ham radio can and can't do. They should feel comfortable in their relationship with your organization, and know that they CAN count on your volunteers when the need arises. Being a leader of a group is work. It's not to be taken lightly. I've seen dozens of groups fail painfully because the leader decided to put off meetings, skip nets, or otherwise not take their duties seriously. Apathy is a killer, and has murdered more organizations than I care to count. I've also seen leaders get involved in things that regular volunteers should be doing. For example; the leader should not always be the guy that takes the net, sets schedules, chairs projects, does the meeting agenda, and invites in people to put on presentations. You should delegate! Distribute! Divest yourself of the minutia. You should have the support of all your volunteers. Everyone doing just a little bit is better than one guy doing a lot. Don't get involved with small insignificant stuff, when the larger picture is ignored. I once knew a guy who focused on writing MOUs (Memos of Understanding), by-laws, maps and guides. He would get into long debates about league protocols, and how other organizations did things. He ignored the nets, membership, and training. Consequently the organization fell apart. Keep your eye on the prize! Bylaws and MOUs mean squat when an F4 tornado is coming at your community and you don't have people, the net, nor the training to be effective. One of the biggest things you hear from successful people in business is that it's not the amount of hours they work, and how hard they work, but whom you have selected as your management team. A good leader is one who has the right people. If the leader is sick or can't participate in an event, things go on as scheduled. A bad manager is one where everything comes to a halt if they are not involved in every single phase and function. You should never take on a leadership position unless you are fully prepared to do the necessary work. You should set up a good team consisting of secretary, treasurer, one or more vice presidents, trustee, and appropriate chairmen for your committees. You should not do it all! For managers or officers of a volunteer organization, here are some suggestions for making, and keeping your organization's integrity intact. Ask yourself; Why do I want to be the leader? Am I able to lead, or am I already over-committed? How much work can I shoulder? Will my position compete with other volunteer organizations, hobbies, and personal needs? Am I the leader because of peer pressure? Am I the leader because of sympathy? What is my level of commitment? Does this sound familiar? If it does sound familiar, a lot of reasons for being a volunteer go hand in hand with being a leader of an organization. You should be a leader for the right reasons. Before accepting the position, ask, "am I invested 100% in this organization?" Check your volunteer applications carefully. If you have the ability to run criminal record checks it would be advisable especially if the applicant will work with the public. Ask the applicant to produce a copy of their amateur radio license, and check the class of license and expiration dates. Do they have a valid drivers license, or points on their license? Check your applicant's ability to operate the equipment your organization uses. Do they know area repeater frequencies, and FCC rules? Do they know how to change frequencies, set PL tones, and have a basic understanding of how a transceiver works? Do they know common procedures, and the difference between repeaters and simplex? Do they know basic propagation situations, power, antenna height, and how it relates communications? An area often ignored is when volunteers are required to use their own equipment, but they don't know how to operate it. New hams sometime get "deals", or inherit a radio from someone else. At a venue I recently attended we were forced to change repeaters because two volunteers could not change their frequency or program in PL tones. If a volunteer does not understand their radio's operations or has something incompatible, ask them politely to study the radio and resolve the issue. Optionally, you may want to loan them a radio, or council them on how to operate a radio. Changing your entire operation because a volunteer is not trained to operate a radio, or has improper equipment, sends the wrong message to everyone. Surprising as it seems, there are new hams and volunteers showing up that know nothing about basic amateur radio operation. You need to be the "filter" for quality control. Always hold regular scheduled professional meetings, and take attendance. Members who don't show up should be queried why they chose not to attend. When you talk to them, do it in private and not in a public forum. Even a "we missed you last week" mentioned on a net can be misconstrued as calling someone out publicly. Not participating is no excuse. Make sure you hold regular scheduled nets. Like your meetings, you should take attendance and question members that never or seldom participate. Keep a record of volunteers that participate in all organization functions. Audit their status at each quarter. At the end of the year their record of participation should weigh into their continued involvement with the organization. Volunteers who participate should be praised and complimented. Those who don't participate should be asked why. (More on this later). At one organization I know, they have a point system for the training taken, hours volunteering, and events they participate in. At the end of the year awards are given in the form of a framed diploma to the top people. Keep track of all volunteer achievements. If they take classes that benefit the organization, these should be made a matter of their record. Ask the achiever to speak about their classes and the good they see in the learning experience. Hopefully it will motivate others. All meetings, projects, drills, nets, and training sessions should be scheduled well in advance. A good idea is to have a full year of activities prepared by the first of the year. This allows your volunteers to properly plan around events, including family vacations, local and distant hamfests, and other personal time away. Provide training for people, and stress the importance that all volunteers participate. Emergency managers can usually provide training at little or no cost. It is important to have your volunteers as educated as possible. NIMS, CPR, Hazmat, are all good to know. Perform drills on a regular basis. If your emergency manager is unable to get you involved in a state or regional drills, make up one that will allow your volunteers to get a feel for the heat of the action. Think of various scenarios in your community you might have to respond to. Formulate a drill, and allow all volunteers to experience the action. Then go back and analyze what you did right and wrong. All your volunteers should know how to act based on the training and drills they attend. They should not have to ask what to do when an emergency arises. They should say, "where am I needed", and know what to do. When holding a meeting, have a written agenda and follow it. If possible schedule a presentation or program that pertains to the organization's mission. Many organizations have their guest speak first, then do their regular meeting. That way the guest may leave if they don't have the time to sit through a meeting, (although, extend the courtesy for them to stay and learn about your organization). Never, ever, allow meetings to develop into a kvetching sessions, or old war stories. If someone brings up something not pertinent to the organization, ask him or her to hold their comments till after the meeting. Close the meeting before allowing them to start. If they cause a scene, it's advisable that you and members of your administration meet with the volunteer privately right after the meeting and discuss their behavior. Disruptive behavior should not be tolerated. Items that need to be voted on by the volunteers should be announced to volunteers thirty days prior to vote, allowing them time to think, and research the subject. Dropping it on them at a meeting is unacceptable if you expect a vote and approval the same day. Keep accurate minutes of your meetings, and remind those who are members of committees a few days ahead of a meeting that you will call on them for a report at the meeting. Don't ambush them at a meeting and expect them to come up with figures and details. The leaders of the organization should not be the only ones doing the work. In making your list for the year, assign what you feel is a reasonable number of people to perform tasks. Make it known that everyone needs to take a turn, and that nobody should have to do something twice until everyone has rotated through the list. Distribute responsibilities. When you hold nets, everyone should have a turn at performing as net control. It's a good idea to announce on the air the person who will be next week's net control, based on a list you have created ahead of time. That way you have record of whose turn it is, and you have plenty of people to know whose turn it is. If net control forgets to start the net, someone else should jump in and start the net. They can always abdicate to the scheduled net control if that person shows up late. Don't let a net fail because nobody wanted to jump in. This sends the message; "failure is OK". Keep your net orderly. A net should have a preamble, followed by a check in of volunteers. Keep a record of those who check in. If a non-volunteer checks in, ask them to wait till the end of the net and you will be happy to answer all question. Half of the time their questions are answered simply by listening to the net. You should train and advise your volunteers on proper net protocol as well as permissible transmission. Never allow arguments, disagreements, or any non-organization content to take place. It's also a good idea to make it known that promotion of other organizations, clubs, or any advertising is prohibited. This is YOUR net, not theirs. If they insist that they want to pass information, ask them to wait till after you have closed the net. If you have someone with a disagreement, ask him or her privately what it is. Acknowledge that you understand the problem, and you will get back to them shortly. Immediately meet with your team and articulate to them the concern of the volunteer. Then, and within a week, you and your team should meet with the person and discuss a resolution. Hopefully the problem can be corrected, but in some cases you may have to tell the volunteer there is nothing you can do. If the volunteer threatens to quit, express regret, but tell them that this is the position of your team and if they want to quit all they have to do is draft a letter of resignation. Someone threatening should never hold you hostage or change your mind. If something needs attention, address it. Find a way to fix the problem. Never allow it to become public discussion or a source for volunteer's complaining. Don't make assumptions, jump to conclusions, or suggest solutions without getting your facts correct. If it's a problem that requires finance, find a way to finance it without volunteers being asked to pass the hat. Look for outside donations, grants, or public funding. Don't ever suggest that a particular volunteer shoulder the expenses. Finally, don't rehash the problem on nets or at meetings. All you do is set up a scenario for more complaints and moaning. When planning drills, and projects, plan ahead. Prioritize. You should have a committee meeting prior to the event, and finalize details well in advance. Then, articulate the plans to your membership. There should never be a situation where on the day of the event volunteers are in the dark. Make sure you have the people and assets in place before saying, "we're all ready to go." After drills and projects, always analyze your successes and your failures. Remember, a failure is a learning experience. But if you fail at the same thing twice, shame on you. Volunteer's time should never be wasted. It's a poor idea to have the whole organization out for an event that only requires three people. Likewise, calling everyone to a meeting and then announcing you don't have anything, or there is no program for the meeting is not only an embarrassment, but it wastes volunteer's time. As you look out at the faces for the meeting remember that their time is no less valuable than yours. Be prepared, and be respectful of their drive to and from meetings, and the time invested at the meeting. Be honest, and ethical. Own up to mistakes and lapses in judgement. Never lie if questioned about organizational activities, or embellish situations. I knew a ham that made a lot of accusations about another repeater interfering with his repeater. Openly, on the air, he accused the other repeater of QRMing them. After checking the situation, the problem was with his repeater. The other repeater owner was falsely excused. Sadly, no apology was made. A leader speaks for the club, and if the words they choose, and the things they say speak for the whole organization. Do you waffle? Do you excuse poor performance or bypass conflict? A good manager gets things done. You should not get in the habit of producing excuses, or dragging your heels in completing projects. For example, if your organization said they would install an antenna for an emergency office, you and your organizations credibility is on the line if someone has to keep asking you, "did you get it done?" Don't say you'll do something unless you will do it. If you openly excuse poor performance, you send a very clear message to your other volunteers that failure is acceptable. If you don't resolve problems, then you tell your volunteers you have no control. If you want the position of manager, you need to manage your organization, your position, and your volunteers. If you can't do this, perhaps management should not be a direction you take within the organization. Use Public Relations cautiously! The best way to sabotage your organization is to make up stories, embellish events, or make it sound like your organization has done more than it did. You can write a letter to the editor of a local newspaper to tell of the good deeds being done by your organization, but be accurate in all details. The letter should be short, to the point, and tell how your organization benefited the community. When helping law enforcement, fire, and EMTS, ask them to assist in your press release. Sharing the experience is not bad. If you invite the press to an event, make sure they know the right details. Don't try dazzle them with your high tech geeky equipment because only hams care about that. The public want to know who you are, what you did, and how did it benefit their community. That's all. If your work and service is good, then it will speak for its self. Remember, image is everything. Your people and your equipment site should be neat, professional, and safe. A funny story, (or not so funny if you are a member of this club). A ham radio club had the idea to be in their communities Labor Day Parade. On the day of the parade they loaded up a hay wagon with a few of their members pulled by a beat-to-heck pickup. As it came down the parade route, there sat three very obese guys with HT radios on their hips. They wore ripped bluejeans and t-shirts that didn't cover their stomachs. They looked forward with no emotion, and the sign on the side of the hay wagon said "_____ Ham Club". A little girl in the crowd summed it up. "Ham? Daddy, do they call them guys hams because they look like our pigs at our farm?" Nobody noticed the radios, nobody connected that these guys talked on Amateur Radio � but the image they placed in people's minds lasted forever. Perception is everything! Think before you go public. And remember the public does have the ability to listen to your transmissions on scanners. At some point in your tenure, you will have a problem with a volunteer. The biggest problem most organizations have is non-participation. Often it's just someone who never participates, but wants to be a volunteer or part of organization. In other cases, they may have been asked to do something then never produced results. There are also times when volunteers become disruptive or exhibit inappropriate behaviors. When this happens you should be quick to ask questions, seek resolutions, and protect the integrity of your organization. Step 1: First of all, talk with the volunteer in private. This should be a one-on-one conversation, but you open by saying that you and the organization have concerns. You should document honestly and fairly the effects of their actions and statements. Remind them of their commitment, and the people it serves. Talk to them about the need for the program to function at the highest level of effectiveness. State that their cooperation is needed to make things work. After you have made your initial remarks, give them ample time to respond. Ask them to tell why they chose the actions they did. Inquire about any circumstances that may not have been apparent to anyone but them, such as a family problem or other employment matters. Avoid accusatory statements, and attacking their actions. Your discussion should be only about what the problem or concern is, and what is needed to resolve it. Often the person who you are talking to will attempt to deflect their responsibility by going off the trail to something that is not significant. Or they will bring up someone else to blame for the action. Keep the focus on their actions and consequences. Take notes in front of them, and articulate your steps for corrective action. Be fair in your actions. Then set a meeting within a month to track their progress. You should always state a positive resolution of the problem, and establish a benchmark to measure change. And state that not changing their actions will result in dismissal. End stating your confidence in their ability to become an even more valuable contributor to the program's goals if they so choose and want to. A meeting like this is especially effective in dealing with such minor, but annoying, performance problems as the volunteer who is constantly coming in late, not participating, or becoming a minor nuisance to the rest of the organization at meetings or on nets. Be aware that in this first meeting, it might become apparent that the volunteer simply wants "out". You should have prepared a graceful way to allow them to move on to some other assignment or take some time off from the organization. I often have a form, generic, which states "I have decided to leave the organization, and pursue other interests." The volunteer only needs to sign and date this to leave. If belligerence is their response, suggest they move on to some other community effort immediately. Above all, keep control of the situation, take the high road, and don't say anything that you may regret later. Step 2: If there is a second meeting with a volunteer who says they are willing to work on correcting their actions, review the goals agreed to in the first meeting, and indicate to them their progress. If no progress has been made, ask why and what would help them move toward the adjustments needed. Ask them to clarify what is preventing them from success. At this point you must document, and have them agree to specific changes in behavior by putting the new changes in writing. Document specific what the problems are, and results you need. End by stating the consequences of dismissal if they do not live up to their end of the bargain. Keep your meeting and all matters strictly private. Agree to meet for a final time in 10 to 14 days. Sometimes people feel it necessary to discuss or complain about their meeting to other volunteers or friends. If another volunteer asks you about details of the meeting, simply state that the matter is between you and the person in question, and you have nothing more to say. If they press you for details, state firmly again, "I have nothing to say". Do not get drawn in to revealing details that may put you into a bad position at your next meeting, or give the volunteer the opportunity to say that you are speaking about them behind their back. Regardless of how intense the person might be, silence is golden, and recommended by most lawyers. Step 3: At the third meeting you might want to have another member of your governing board there. They should start out by articulating clearly why the volunteer's actions are not supportive of the organization in a non-confrontational manor. For example, if the person fails to show up for nets, or arrange to have someone come in for a program, they would express how this is unfair to the other volunteers to be left in the lurch. If they are disruptive on nets, explain to them how this is not proper conduct, and how they are being perceived, and the organization is being painted in the public by their actions. Then, this second person should say no more, and refrain from making any further comments as you address the issues. Make sure you give praise to any success toward the agreed-on goals. If some of the goal has not been met, ask the reason why. If the goals are vital, state this as unacceptable and tell them they will be monitored for a week to insure they live up to the organization's requirements. If none of the goals have been reached, remind them of the previously stated consequence of removal from their position. Thank them for their previous service, write up your actions and allow them to leave. Collect any badges or keys to organization's property and vehicles. Make arrangements to get any organization's property back from them within a week. If there is a concern about retribution, have them sign a copy of the letter they received after the second meeting in which problems and corrective actions were discussed. If they refuse to sign it to acknowledge their understanding of the issues raised you might want to call them, you have a witness to attest to this refusal. Keep your cool, and never threaten, belittle, or swear at the person. Don't give them ammunition to take back to other volunteers or the public that paints you in a bad light. Keep accurate documentation of all events, dates, times, and who was present. You may need this at a later date should the person decide to either take on your organization through legal means, or in the public forum. Should they harass other volunteers, tell lies, or jam your net, you will need this documentation should the police or FCC get involved. Confronting problem behavior in volunteers can be uncomfortable, unpleasant, and often a difficult task for someone who has not acted in a managerial position. If you have never been in a position to talk with people about performance, it might be wise to take some courses on-line in human resources. This article and PDF may be distributed provided that it is not altered, and it is correctly attributed to the author. Frederick Vobbe is a licensed amateur radio operator (W8HDU). He is Vice President of WLIO and WOHL television stations in Lima Ohio, and Director of Engineering for Block Communications Inc. Frederick has worked in the broadcast industry since 1968, and volunteers for the Allen County office of Emergency Management, and is co-chairman of the Lima/Allen County EAS District. Frederick is Vice President of the Lima DARTS (Digital/Analog Radio Technical Society) and trustee of the KT8APR repeaters, as well as the W8AOH repeater owned by the Allen County office of Emergency Management. He can be contacted at or by mail at 706 Mackenzie Drive, Lima OH 45805.